Oh the bathroom. This is by far the biggest and most important project for us. Because it’s the most vital to have finished when we move in. 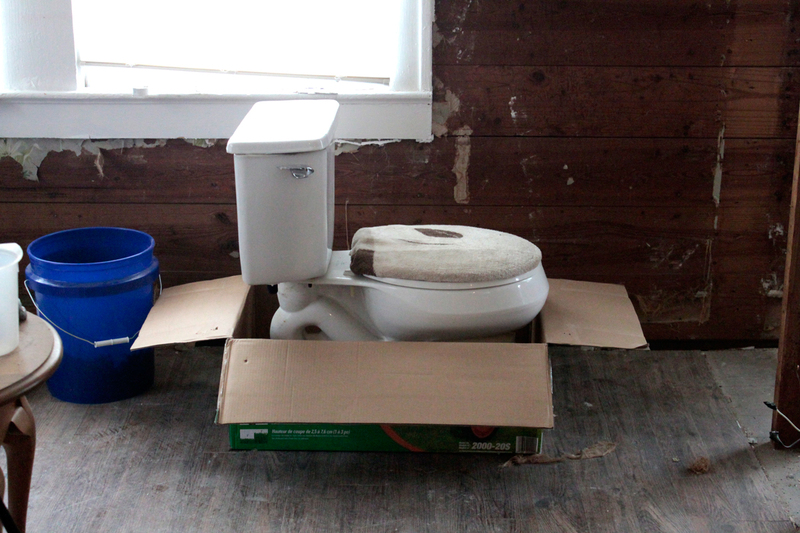 So this day was definitely exciting when we got to officially remove the toilet! 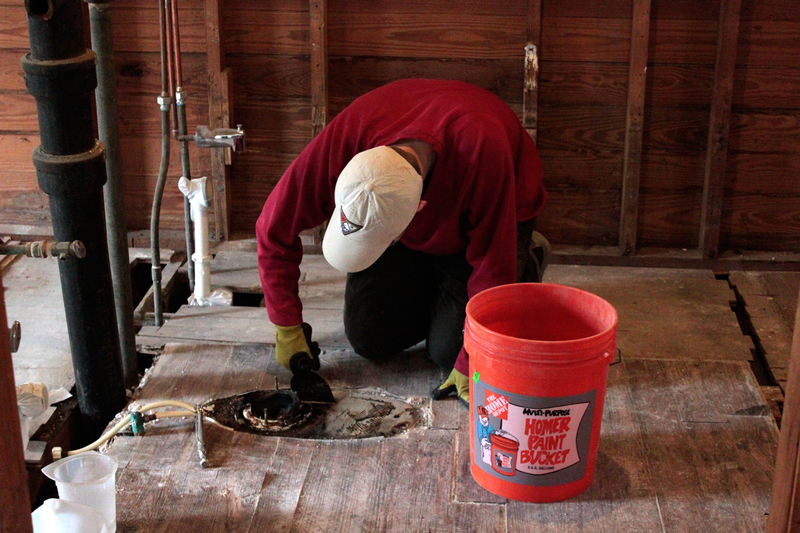 You can see J scraping the goo that seals it to the floor to check that we can pull up the flooring and not take out plumbing with it on accident. Once that was done we pulled up the flooring. 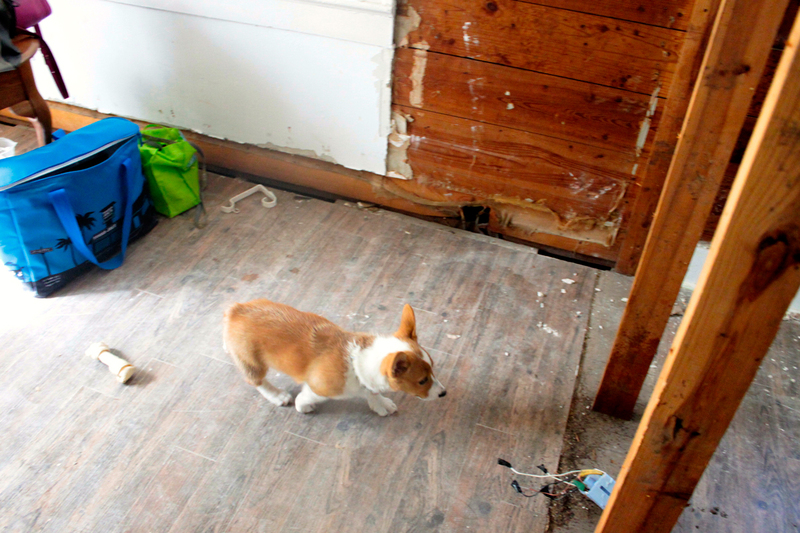 As we pulled that up we discovered the subfloor would have to be removed with it. This actually proved to be in our benefit because we made a discovery. 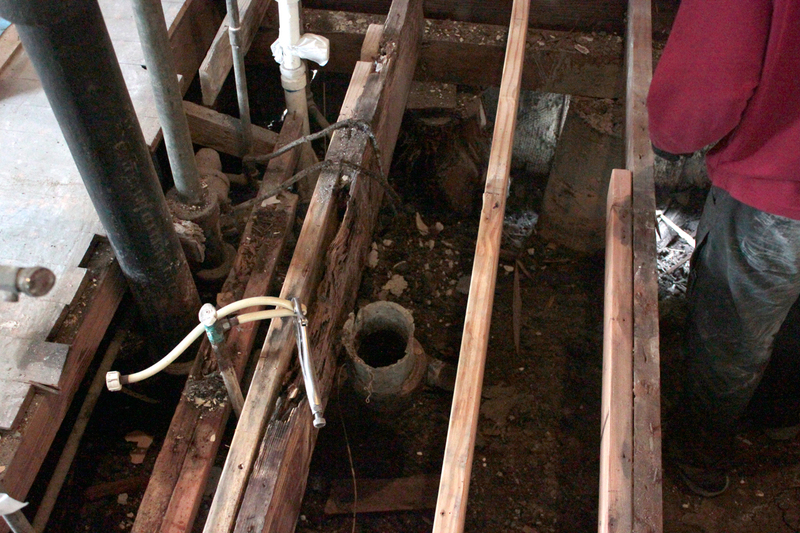 The beams under the floor were rotting out. Meaning they could one day potentially cave and we’d have a huge problem on our hands. Finding it now while we’re doing construction was definitely a blessing in disguise. In these photos you can see where they had previously added a new board and supported the rotting ones with a second board. This process is calling sistering. 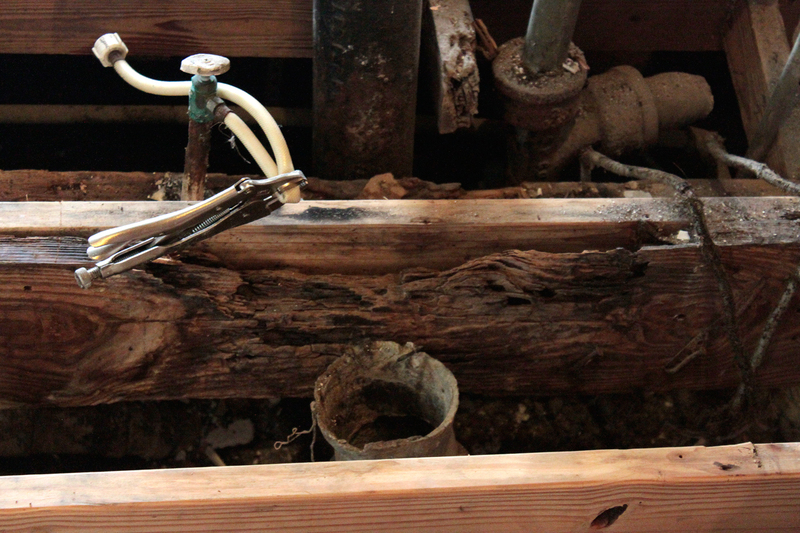 To make thing better long term we planned to completely cut out the rotted sections and replace with new treated beams. 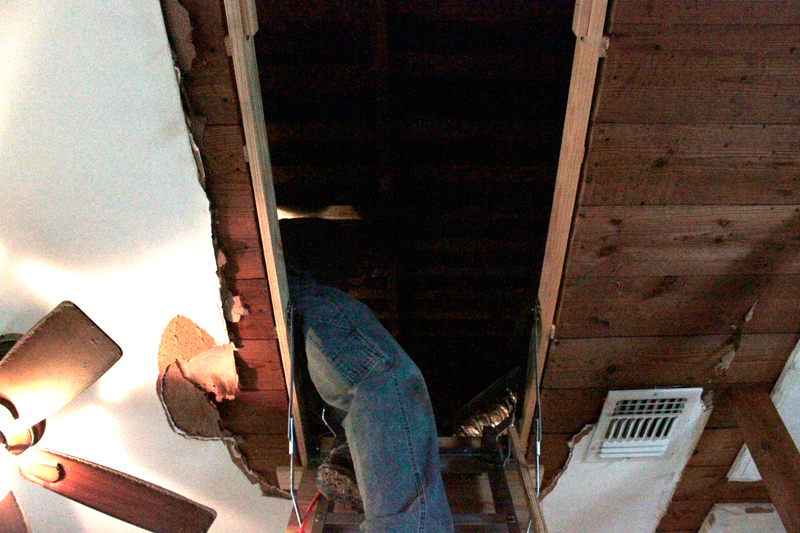 Having the crawlspace exposed also came in handy later when we worked on removing all those old pipes too. But that is another post. You might be wondering about the title of this post. 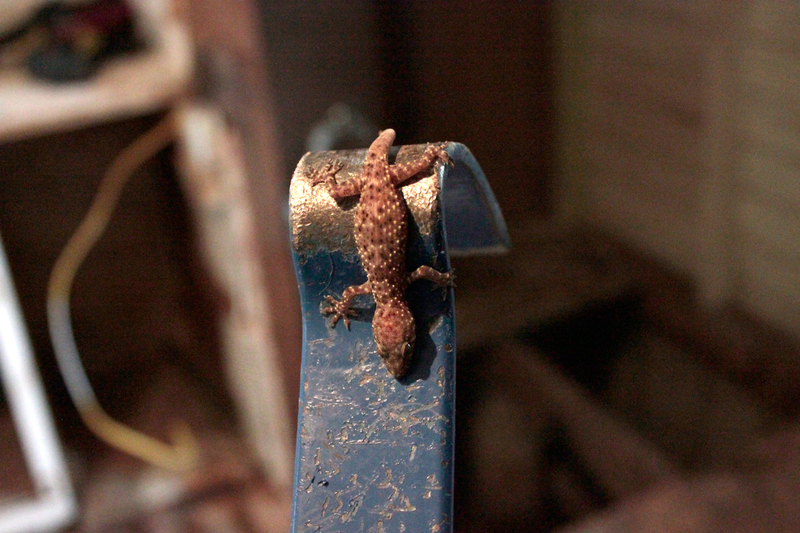 Working with Lizards. What could that mean? 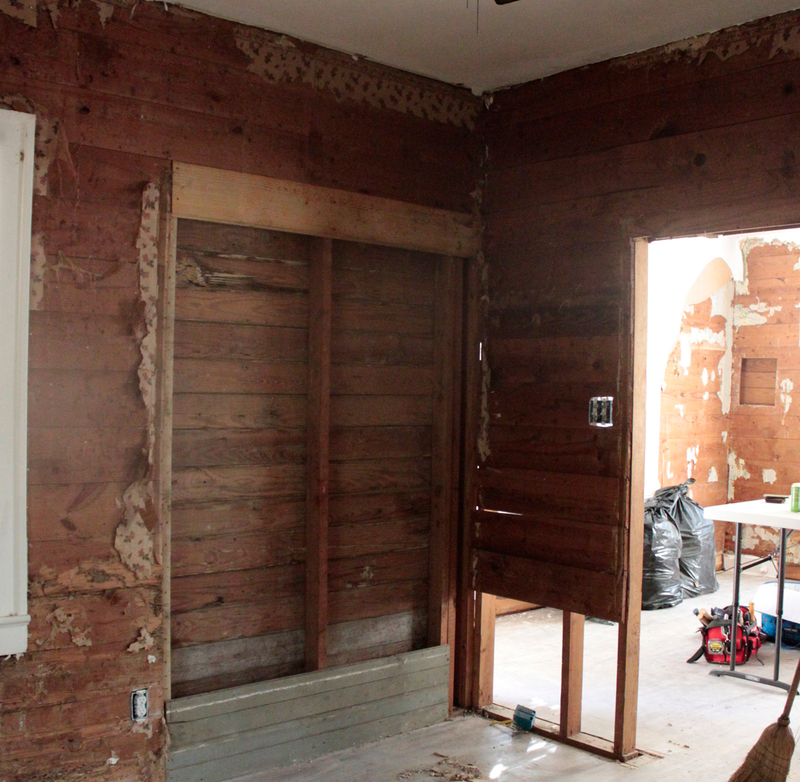 Part of the process of removing the flooring and prepping those floor beams required removing more shiplap from the walls for better access. 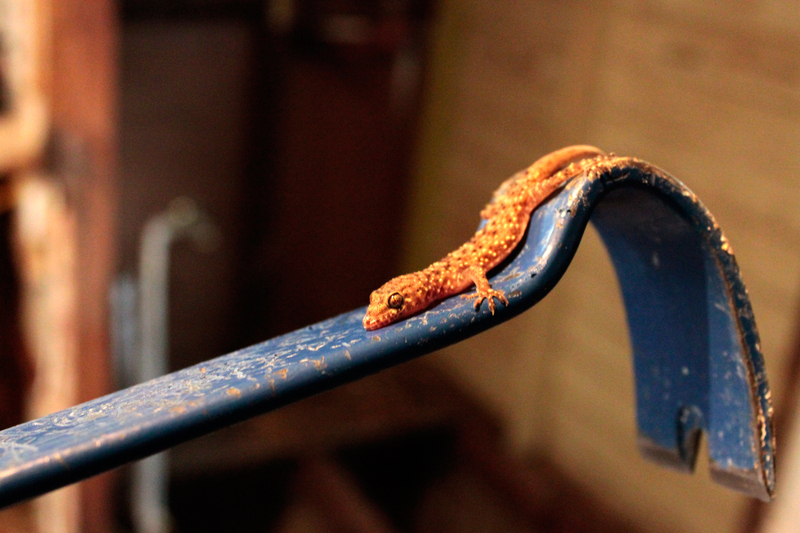 As we were doing that we had a few frights when lizards would zip out of their sleeping places in the walls. By a few I mean 7 throughout the day. We really don’t mind the lizards because we can use all help in eliminating the dinosaur cockroaches but when a camouflaged thing moves where you’re working your body reacts before your mind can understand what it’s seeing. They kept us awake that’s for sure. We had a beautiful sunny warm day on Jan. 3 for our first group demo day of the year. We had just a few friends make it out for a very productive day. Our buddy Jacob knocked out all that was left in the bathroom getting us set for the next phase of prepping the plumbing. While that was going on the rest of the guys worked on our new beam that was installed in the attic to support the ceiling as we take more walls out. We also had just purchased some new garden tools and I’ve been anxious to get started on that. So I took advantage of the warm sunshine and tackled removing a bush in the front. It turned out to be a beastly thing with very deep, woody roots and required a saw to get the bulk of it out. The photo doesn’t give it justice into how much work it took to remove. The soil here is compacted and cement like with plenty of large rocks mixed in too. 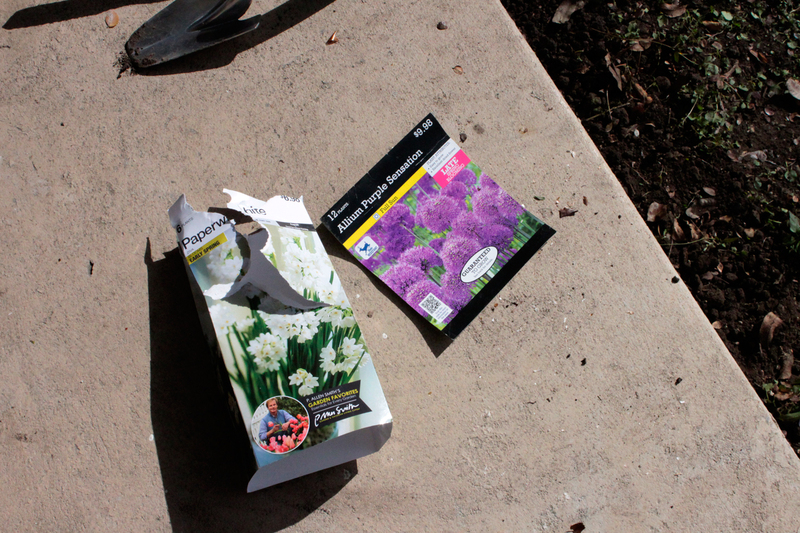 Taking a break from that I switched to the other side of the stairs and planted some paperwhites and allium. I can’t wait to see them blooming soon. More stacks of magazines found in the attic. 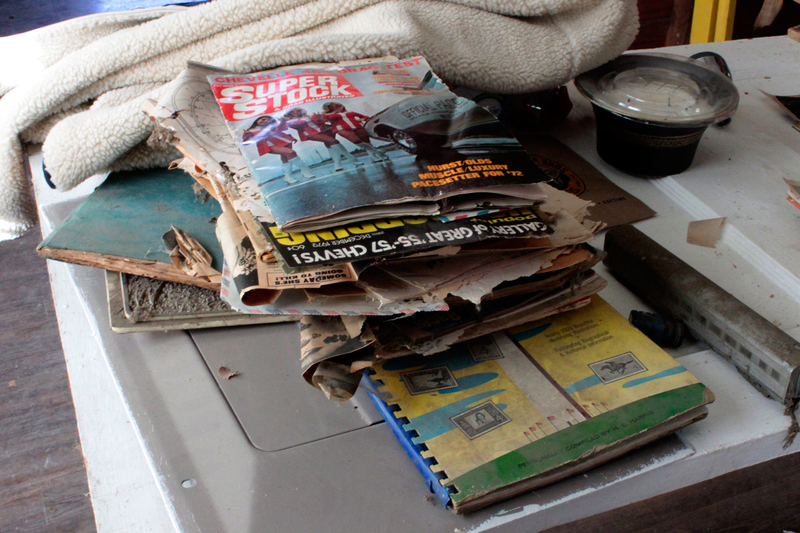 It’s been neat to see what gets left behind in a house and what they tell you about previous tenants. The nail collecting continues. We transition all the cups to a big bucket and we’ve already half filled this 5 gallon one. Well friends, it finally happened. 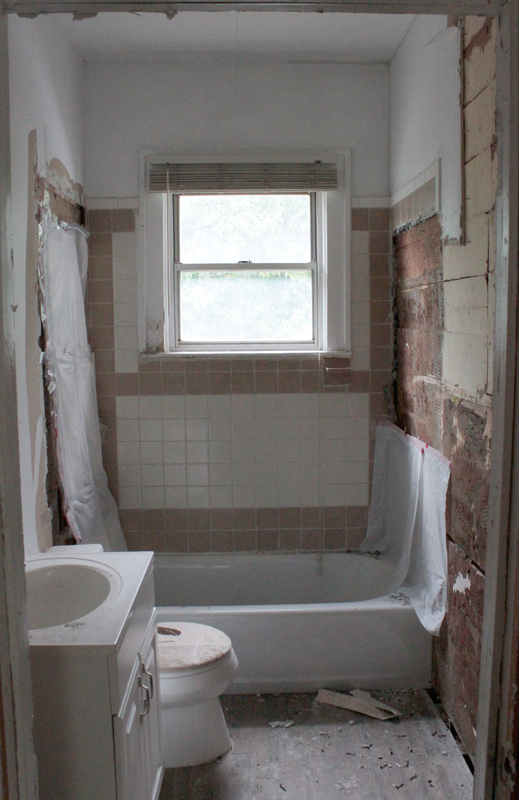 After having made a number of holes in the walls and removing the tile, the entire bathroom was demolished. Well for this post it was completely gutted and most of the boards removed. 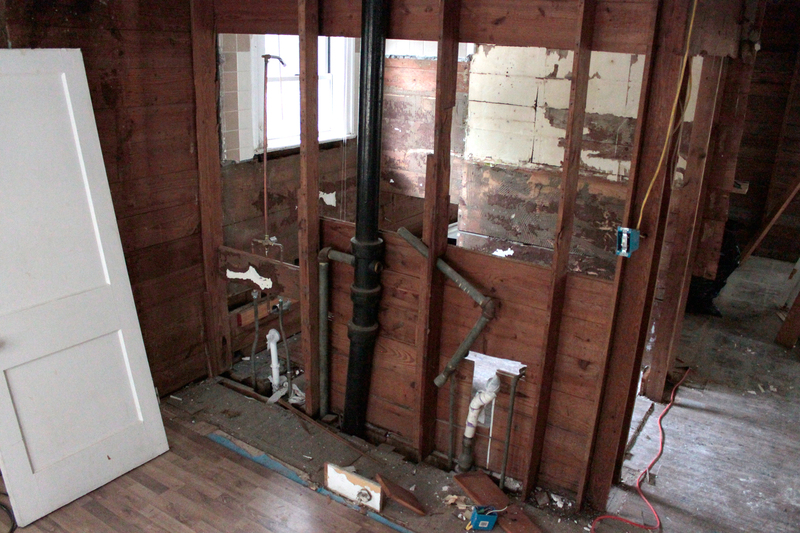 But it’s current state (not pictured) is that the bathroom is GONE. 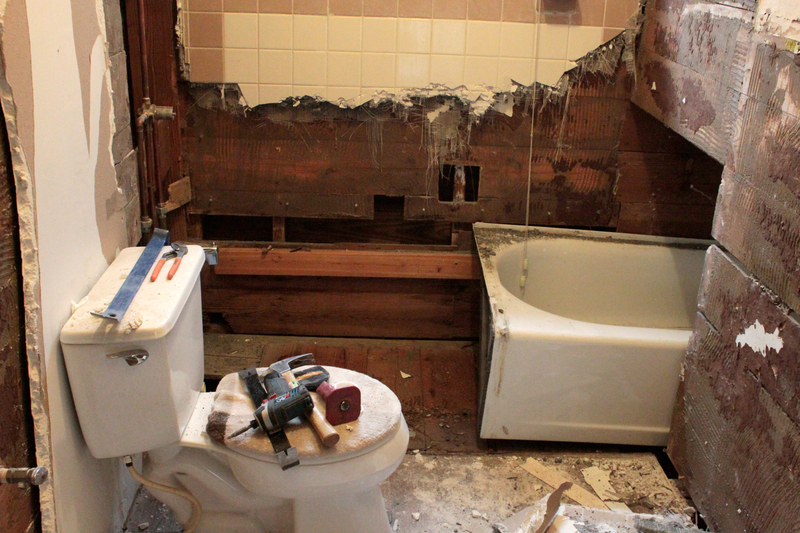 So back to the status of the bathroom according to the photos… On this day we moved the tub out, removed the sink, and carried out the toilet. 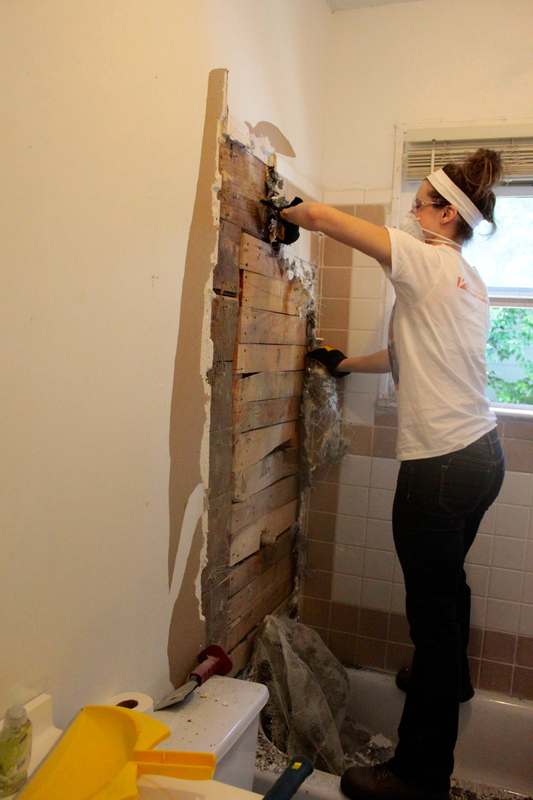 Many of the walls were already gone but we tried to take a few more out with our last bits of the days energy. Here’s the Before picture. Where we still had the plastic sheets up to try and keep it semi private if needed. 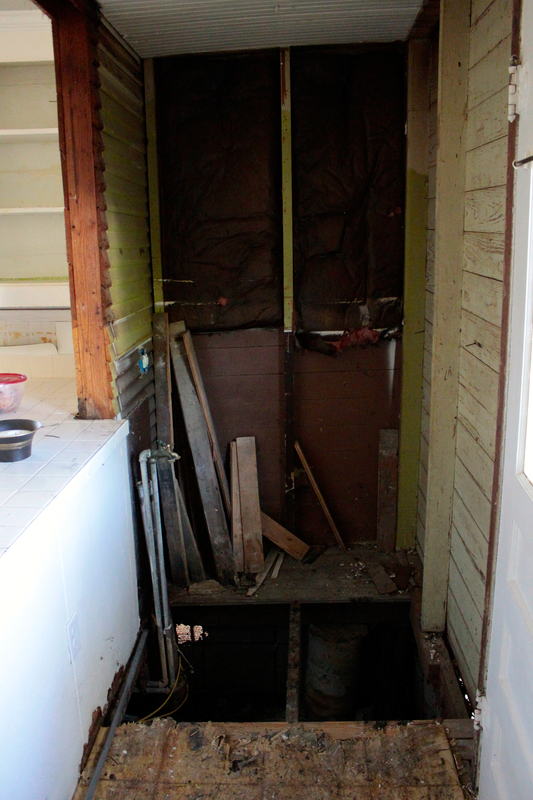 The tub was removed via the hole into the front bedroom that just so happened to fit it’s width perfectly. From the looks of the wood that had been placed underneath it was a semi new addition so that’s probably why the hole was there in the first place. 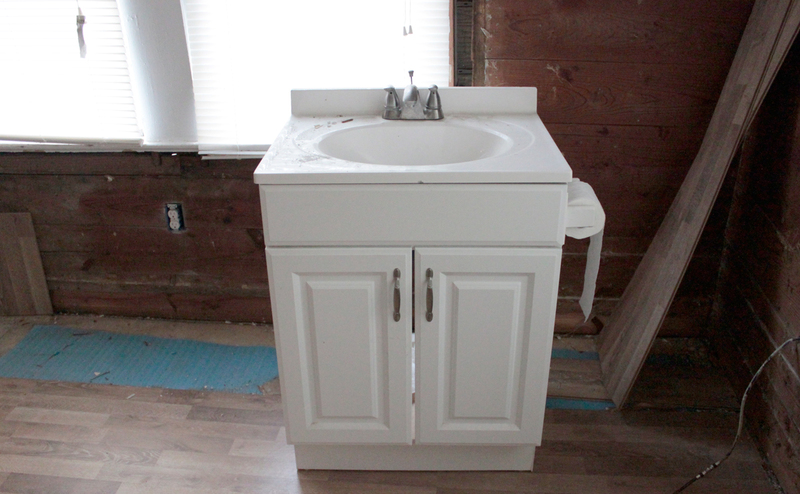 Here’s the sink in the Master Bedroom just hanging out for now. It will be stashed in the garage once we’ve cleaned that place out to fit more trash. 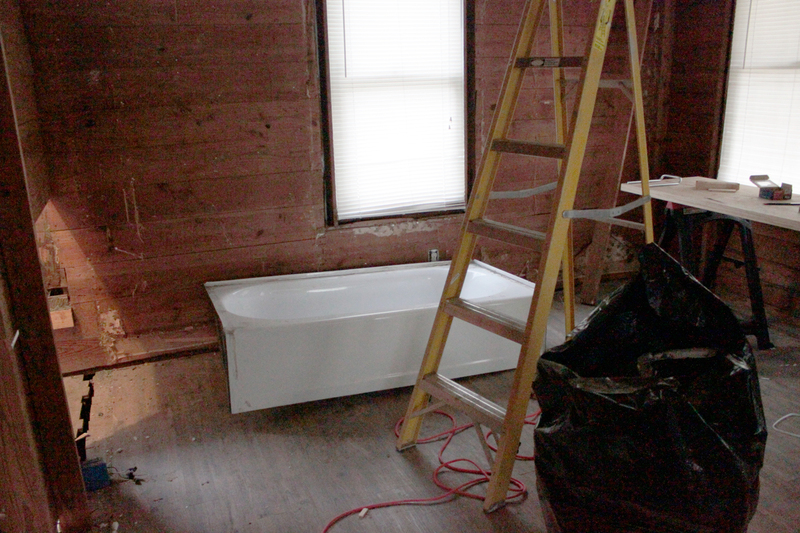 And the tub is now in the front bedroom and has become a place to store chopped wood. Again, a temporary solution until we do more cleanup in the garage. Luckily we’ve figured out a few solutions for getting more trash moved out other than the once a week pickup of our normal trash service. More on that later. Here’s the pipe that remains in the wall until we have time to cut it out. Have you ever been frustrated with a project that you just wanted to smash to pieces? Maybe a printer that just wouldn’t work or even just day to day stress that needed to be directed somewhere? 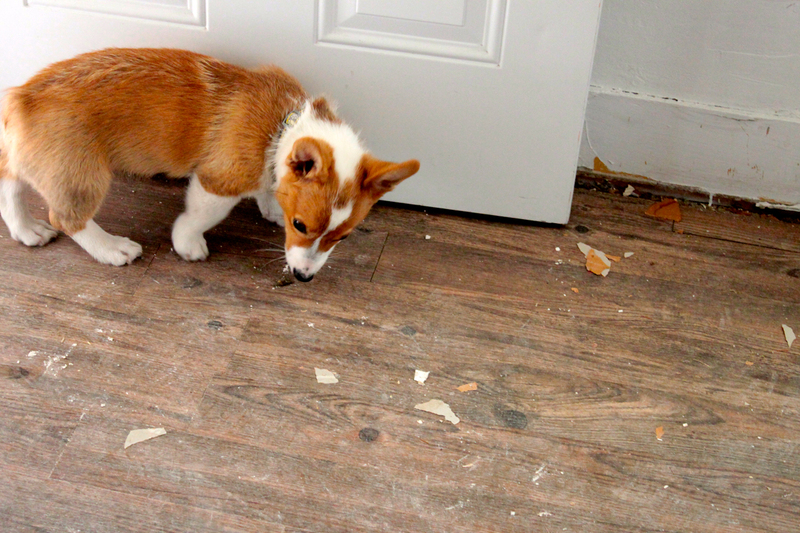 Then I highly recommend removing tile. It’s affixed with concrete if you didn’t know, which requires some major smashing. But be warned it makes a mess. We got super lucky in that we found a way to remove the tile without too much bashing. 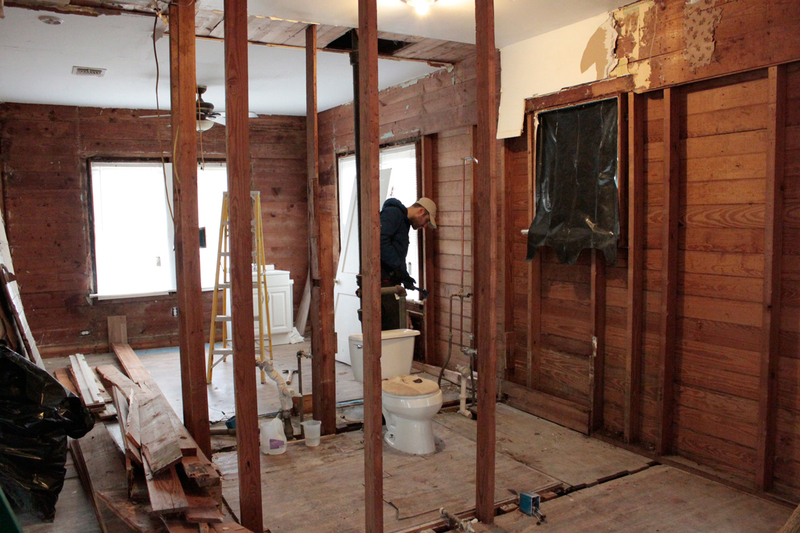 We had removed all the shiplap from the front room leaving the hidden backside of the bathroom wall exposed. AKA we could see all the nails and hammer them out before attempting to remove the drywall and tile. In one of the photos below you can see a grey square in the wall. That’s where we exposed the concrete side of the tile allow us to push/pull the entire piece off the wall in one go. And boy was that thing heavy. 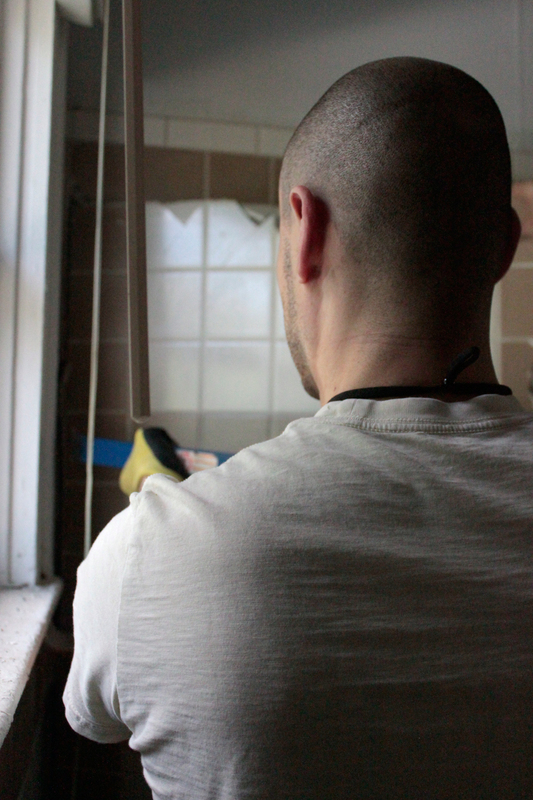 After removing the side piece, the back wall that partially surrounded the window was also able to be pried off. 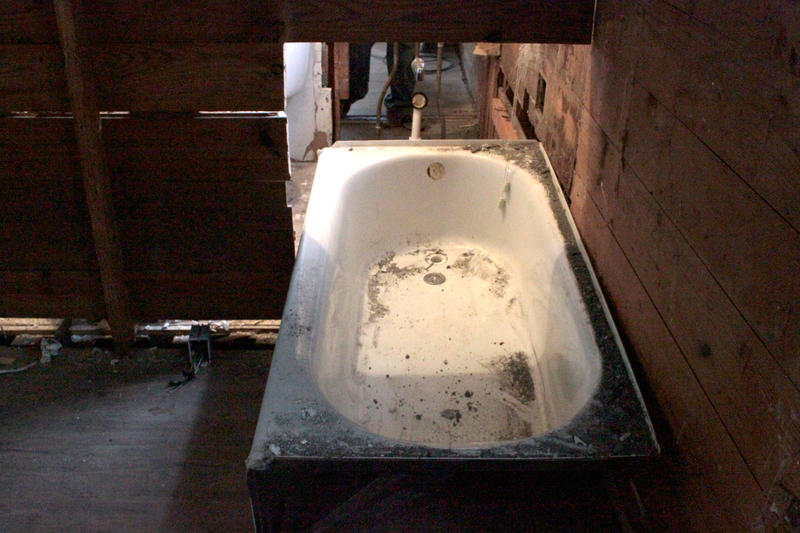 It helped that the tub at that point was unattached to anything at this point too. Just you wait till the next few posts. 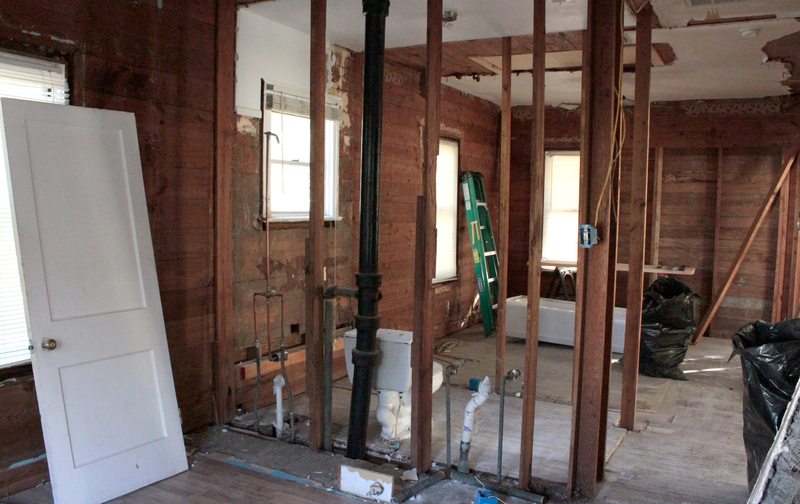 The bathroom is gone. As in gone, gone. It’s really exciting. Do you remember that closet in the Master bedroom that we also lovingly referred to as the only attic access? Well on this demo visit we knocked her out! She is gone as well as the nasty drop ceiling near the back door that was simply silly. The other project we undertook for this visit was switching the blinds. They were originally installed above the windows on the framing. 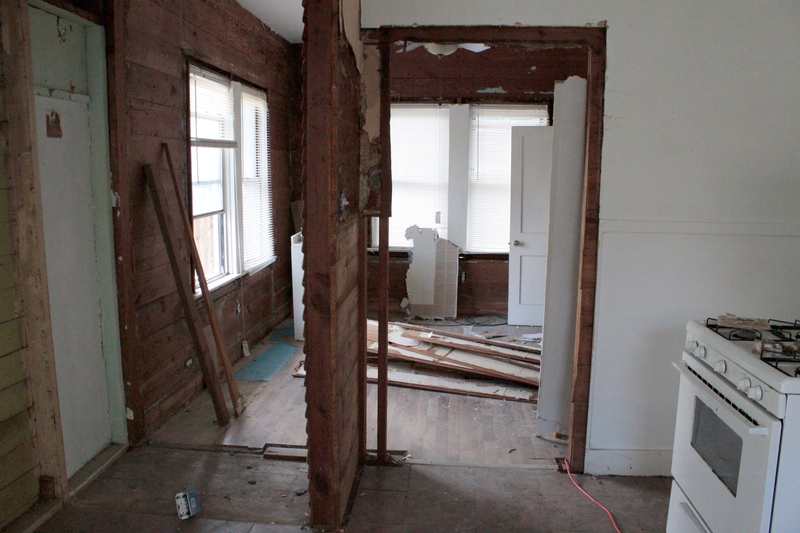 Since we need to move forward with removing drywall and ship-lap we needed to remove the window frames. But doing that would mean losing the privacy/safety of blinds when we’re not at the house. So to fix that problem we re-installed the windows to fit within the actual window framing. That required trimming them down a bit. But they work! Do remember this post where we removed the art on the wall? Well this demo day goes along with that one. Now you can see how delayed I’ve been in getting demo/progress posted. But this long weekend is definitely helping with productivity. We’re catching up to real time progress! On this day it was a lot of re-evaluating our progress. 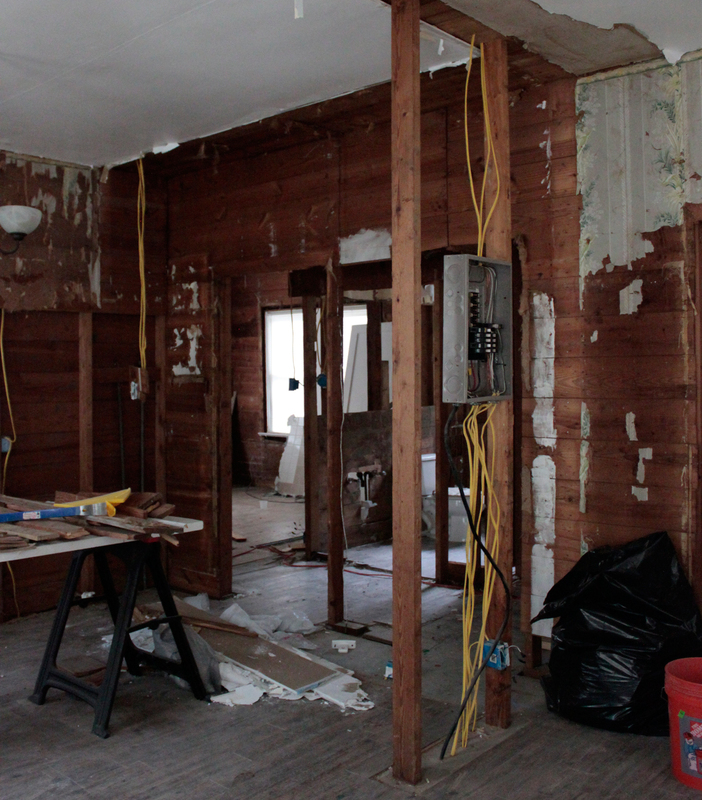 We had removed a fair amount of drywall and ship-lap and were now needing to catch up on a few other walls we’d skipped. 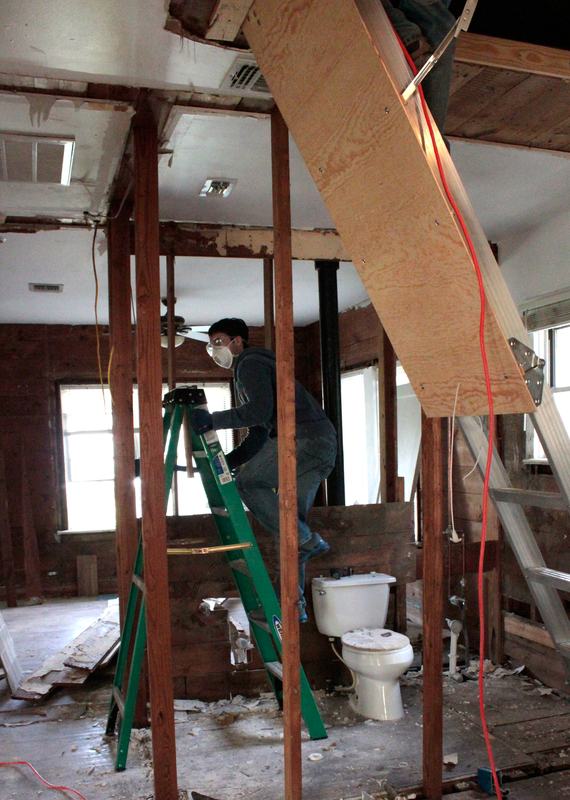 So it was back to removing drywall and getting that dusty mess cleaned up for…more ship-lap removal. More of the same. Psst. 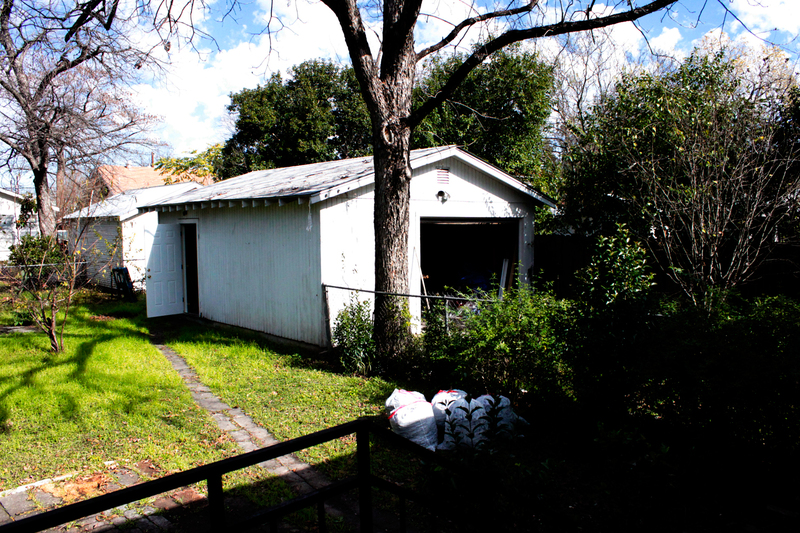 There’s also a sneak peek in the photo gallery above of a change in the garage we are STOKED about. Or at least the 3rd photo grouping on my camera. This day we arrived focused and just jumped into working. So I didn’t capture many in process photos. Also we’re still deep in work to remove ship-lap from all the walls. Below are a few photos of the after. We found a few more areas hiding the old knob and tube wiring, which relies on an air gap (provided by the knobs and tubes) to function safely. Check out the photos and it will make more sense. Folks were certainly trusting of their houses and that no creatures would get in and chew it or build nests to cause a fire. After reading through this post you might be feeling like little has changed. Read back to this, and this post. The demo days are starting to run together. Each time we make significant progress but it’s technically still the same work so they are hard to distinguish as different events in my head. Anyway. 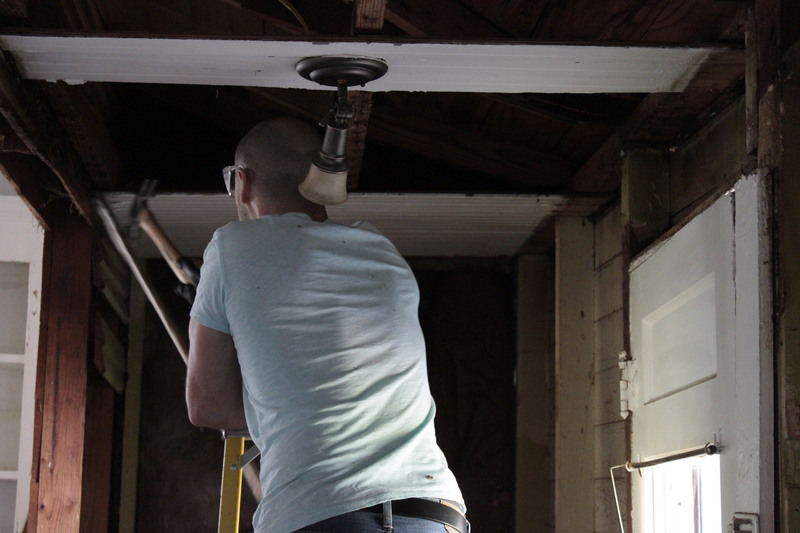 This demo day wasn’t a big group demo day but a night visit to the house to make progress. There was some traveling on the calendar and we wanted to make sure we worked a bit before we left. 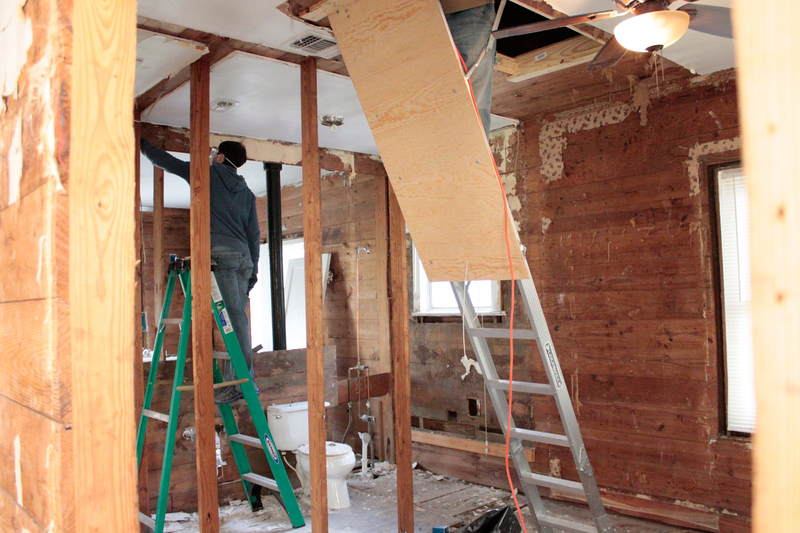 This night we removed a few more boards from the master bedroom wall adjoining the bathroom. It was dark and maybe a little tough to work in minimal light but do-able. Fun story though. We found a friend in the wall. Well, what’s left of him. We found a full skeleton nestled into it’s home in the wall. For the rest of the night I had to make sure I didn’t overthink how big it could have been when it was alive or question the possibility of others. EEK! 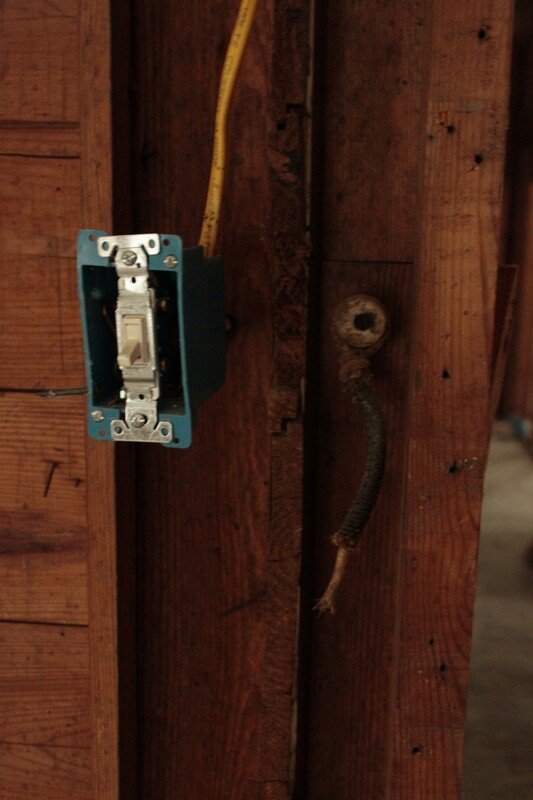 We also found a few random pipes in the wall that as far as we can tell don’t attach to anything. Or they were an excessive amount of pipe added to allow air to escape while the water drains. Either way, a curious discovery. We absolutely love getting help from friends. Using the excitement and momentum from the start of this big project we had a second demo day the next weekend. A lot more boards came down and were hauled off to the garage. 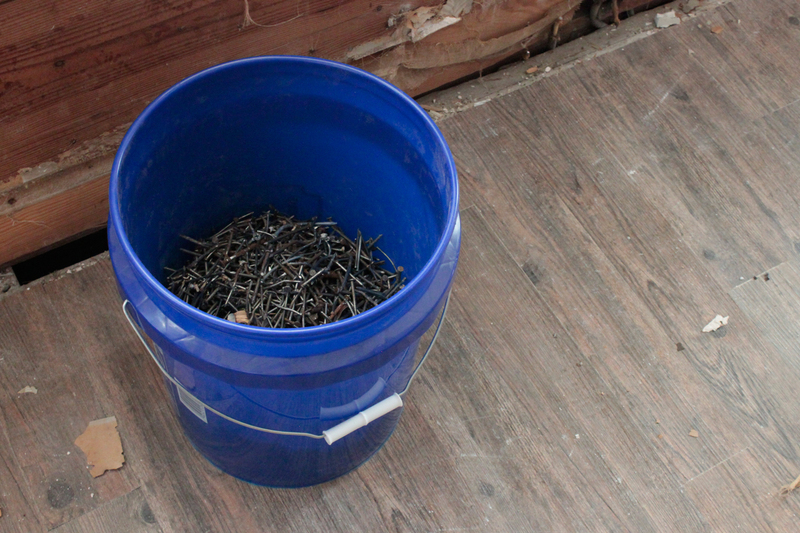 Whoever originally built the house used so many nails in the boards that the garage is looking like a scene from Final Destination ( or so I would guess because I haven’t watched those movies). We’ve begun remedying that situation but more on that later. The house demolition for this day also included busting the tile in the bathroom. 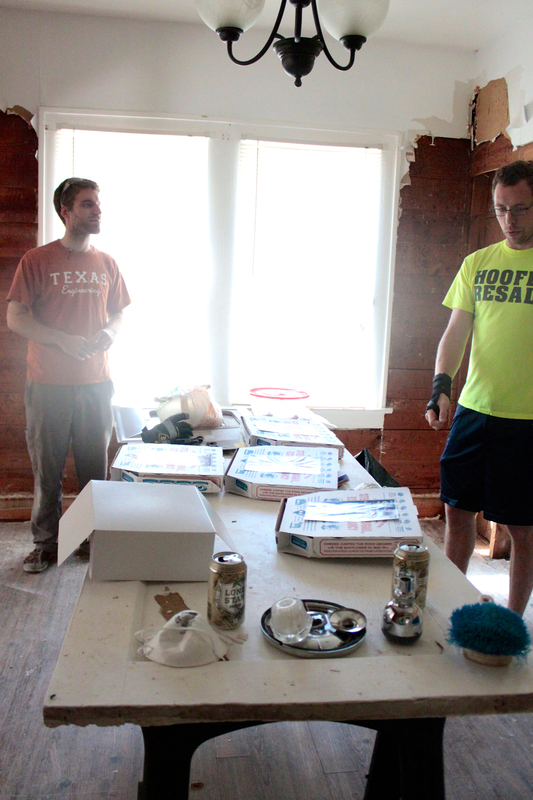 Jeremy and Kristen were our fearless tile crushers. 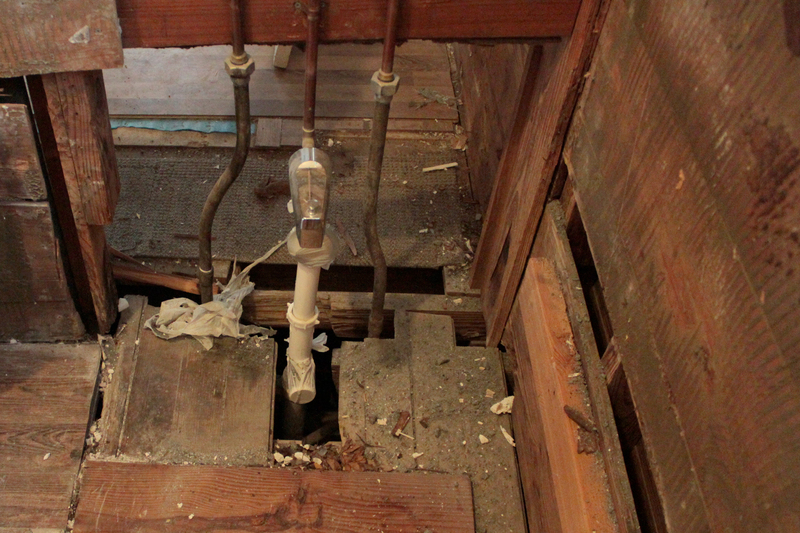 There is now a gaping hole revealing the shower pipe and the master bathroom. 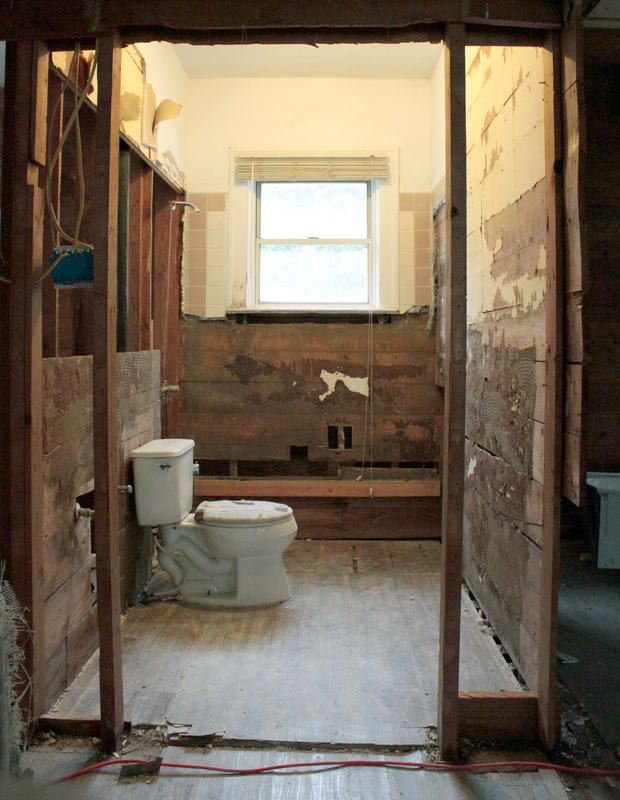 We didn’t think ahead about the fact we now have a less than private bathroom for people to use while they’re working. Oops. 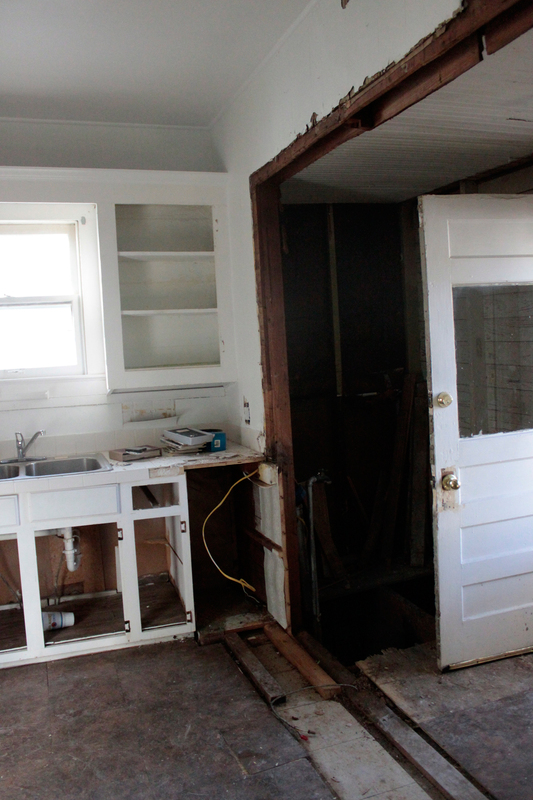 Another visible milestone was having half the kitchen counter removed! And so many cockroaches came out! ick ick ick. (The house will be RAIDed ASAP.) 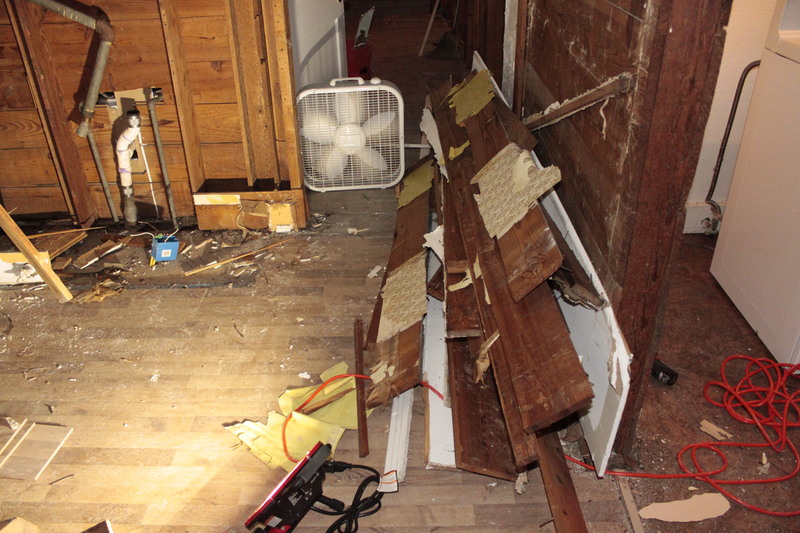 You may have noticed that it cut the room in half and created an odd path through the house. No more! 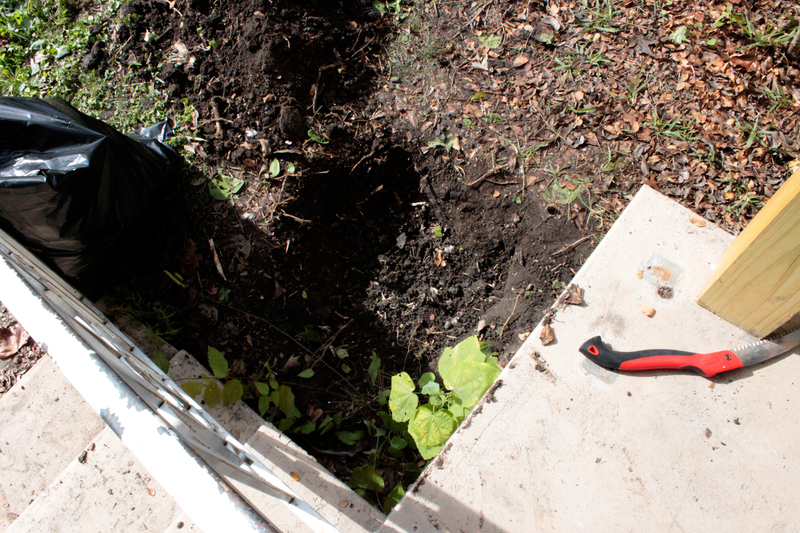 But we do have to be aware of the hole just behind the backdoor where we can see down into the crawlspace. That’s also new. We seriously have the greatest friends for coming to help with this epic project. Hopefully the endless supply of pizza and our endless thanks is enough to keep them happy. And definitely future hangouts when the house is all finished. Looking forward to that for sure. 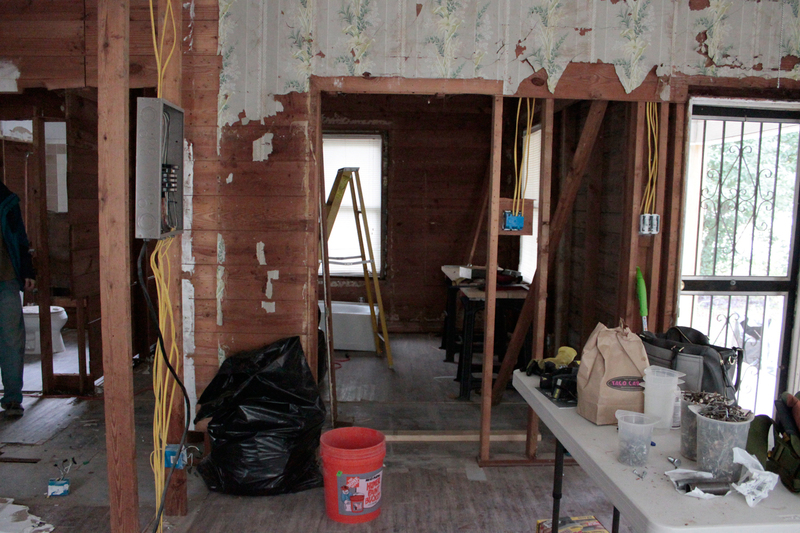 It might help seeing how things have progressed by going back and seeing the Before Photos, and House Demo Day 1. There have been quite a few demo days in the past month that we want to share with you all soon. But we’ve been busy working on the house as well as enjoying the holidays. In the meantime here’s a short video of the removal of the wall painting that was completed on the first demo day then removed just recently. Enjoy!